Yes, couplings are required to be guarded or protected under OSHA regulations... but what exactly does that mean? What exactly are those regulations? OSHA (Occupational Safety & Health Administration) is an organization under the United States Department of Labor that was created under the Occupational Safety and Health Act of 1970 "to assure safe and healthful working conditions for working men and women by setting and enforcing standards and by providing training, outreach, education and assistance." More specifically, OSHA touches power transmission couplings and coupling guarding through its broad Code of Federal Regulations (CFR). Under these regulations, there exists a section, 29 CFR 1910 Subpart O, titled "Machinery and Machine Guarding". While the concepts throughout "Machinery and Machine Guarding" are broadly applicable to couplings, it is within the last subcategory, "Mechanical power-transmission apparatus" (1910.219), that couplings are specifically called out by name. Section 1910.219(i)(2) reads: "Couplings. 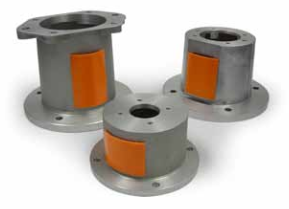 Shaft couplings shall be so constructed as to present no hazard from bolts, nuts, setscrews, or revolving surfaces. Bolts, nuts, and setscrews will, however, be permitted where they are covered with safety sleeves or where they are used parallel with the shafting and are countersunk or else do not extend beyond the flange of the coupling." In addition to these two classic guarding methods, various entities have developed and marketed a number of different proprietary and unique guarding methods. (Note: OSHA does not specifically "approve" any manufacturer's coupling guarding solutions. They only issue regulations and enforce/audit facilities for compliance.) Most of these coupling guard manufacturers will tell you that they have reviewed the regulations, and, that their product, when used correctly, will allow you to be compliant with the regulations. These manufacturers (whose business is selling a better mouse trap) are well versed on the standards and can/will speak to additional standards including ANSI B11.19-201 (titled "Performance Criteria for Safeguarding") and ANSI Z535.4 (which is a Safety Signs and Labels standard). Recommended Follow-On Reading: Given you are on a standards roll, how about reviewing the active coupling bore & keyway standards: Active Coupling Bore and Keyway Standards - What Are They & Where Can I Find Them?